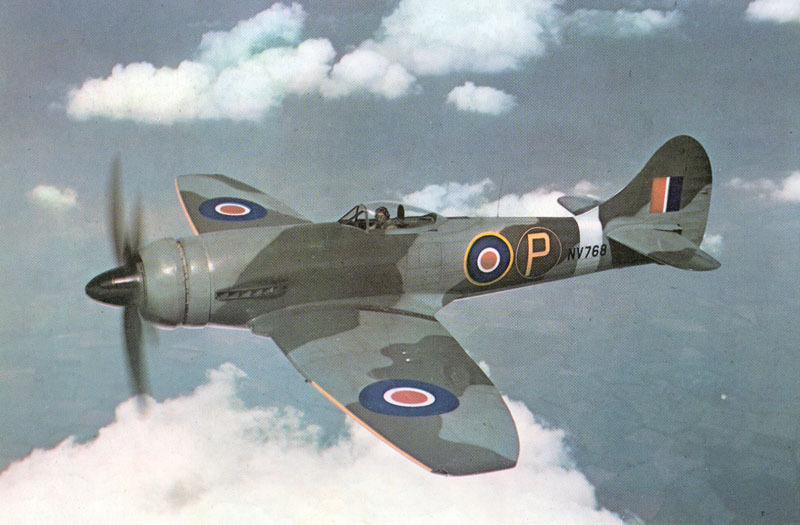 The Hawker Tempest was a British fighter aircraft primarily used by the Royal Air Force (RAF) in the Second World War. The Tempest was an improved derivative of the Hawker Typhoon, and one of the most powerful fighter aircraft used during the war. During development of the Typhoon the design team, under the leadership of Sydney Camm, were already planning design improvements, this process resulting in the Hawker P. 1012 (or Typhoon II). Although the Typhoon was basically a good design, Camm and his design team were disappointed with the wing which proved to be too thick in its cross section; this created problems with the airflow and inhibited the performance of the aircraft, especially at higher altitudes. In March 1940 a few engineers had been assigned to investigate the new low drag laminar flow wing that NACA in the United States had developed and which had been used in the new North American P-51 Mustang. The new laminar flow wing adopted for the Tempest series had a maximum thickness to chord ratio of 14.5% at the root tapering to 10% at the tip. By comparison the Typhoon's wing, using a NACA 4 digit series wing section, was substantially thicker - 19.5% (root) to 12% (tip). The maximum thickness of the Tempest wing was set further back at 37.5% of the chord versus 30% for the Typhoon's wing. The wingspan was originally greater than that of the Typhoon at 43 ft (13.1 m), but the wingtips were later "clipped" and the wing became shorter; 41 ft (12.5 m) versus 41 ft 7 in (12.7 m). The wing planform was changed to an elliptical shape to accommodate the 800 rounds of ammunition for the four 20 mm (.79 in) Hispano cannons, which were moved back further into the wing. The new elliptical wing had greater area than the Typhoon's. The thinner wing also displaced fuel tanks that had been fitted into the leading edge of the Typhoon's wing. 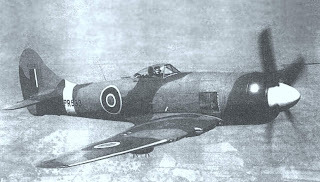 This greatly reduced fuel capacity but Hawker engineers added a new 21 in (53 cm) bay ahead of the cockpit accommodating a 76 gal (345 l) fuel tank, giving a maximum of 360 gal (1,636 l) and an operational radius of 500 mi (805 km) Another important feature of the new wing for the Tempest I was Camm's proposal that radiators for the new Napier Sabre IV engine were to be fitted into the leading edge of the wing inboard of the undercarriage. This eliminated the distinctive "chin" radiator associated with the Typhoon and improved aerodynamics. 2 × 45 gal (205 l) or 2 × 90 gal (409 l) drop tanks.